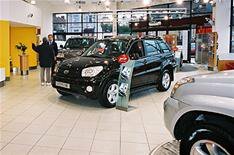 Car sales up despite end of scrappage | What Car? New car sales were up in April, compared with the same period in 2009 despite the end of the scrappage scheme. Figures from the Society of Motor Manufacturers and Traders (SMMT) reveal that 148,793 new cars were registered in April, an increase of 11.5% on the same period in 2009. Although the SMMT expects sales in the coming months to fall off as the last of the scrappage registrations filter through, it has still increased its year-end forecast for 2010, after a stronger-than-expected first quarter. It now predicts 1.92 million new cars will hit UK roads by the end of the year, compared with its previous prediction of 1.82 million. The strongest sellers continue to be superminis, which occupy six of the top 10 places in April and seven in the year-to-date figures.